Once you’ve made your gear choices and dialed in your headphones and click, you’re ready to start recording. In Part 3 of our Pro Studio Tips Series, we’ll go over the differences between live and studio playing, and discuss the importance of playing consistent parts with good dynamics. We’ll also explain the best way to create shorthand Road Maps for each tune to help you be accurate and efficient when you record. 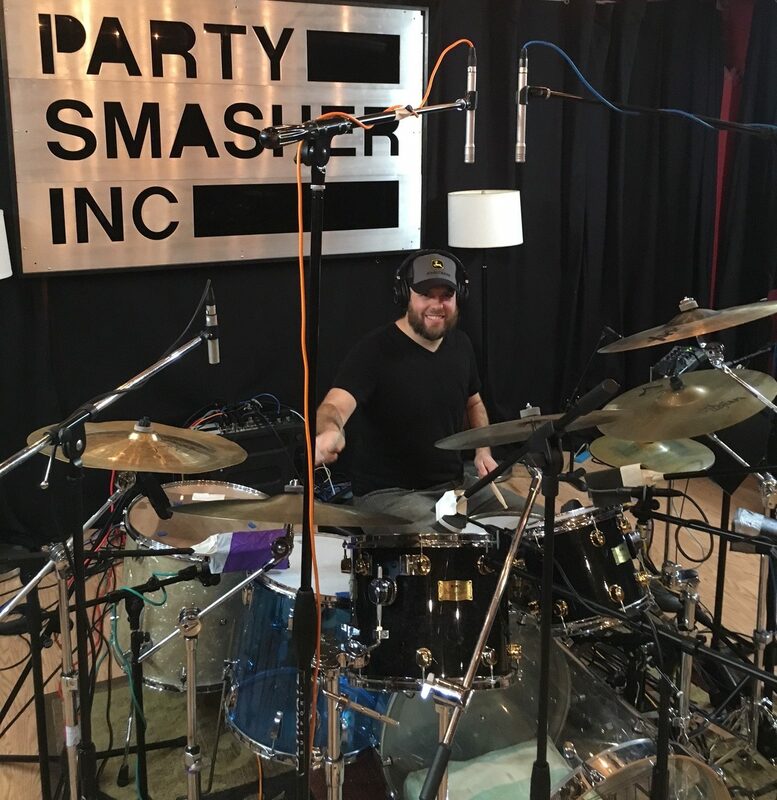 Every note you play in the studio will be captured for all eternity, which means those massive tom fills that feel amazing on stage may be too messy and obtrusive for recording. Remember, there will be many mics on your drums, and they’ll pick up every note you play. Since the engineer will place mics directly over your cymbals (usually sensitive ‘condenser’ mics), it’s important to avoid the temptation to bash away at them like you might in a club. Most cymbals are high-pitched and will cut right through the mix; they’re also in the same frequency range as the vocals and can be overbearing if you play them too loud. If the music calls for it, it’s okay to hit the drums hard – but always be conscious of everything else that’s going on, and don’t overplay. Stamina can be an issue for many drummers, and if you’re hitting as hard as you can all the time, your playing won’t be as clean as the day goes on and you start to get tired. Conversely, you’ll also want to avoid playing too timidly in an attempt to be dynamically sensitive. Quiet playing should still be crisp and confident, and it’s a common trap to slow down or get a bit sloppy during breakdown sections or transitions in the music. 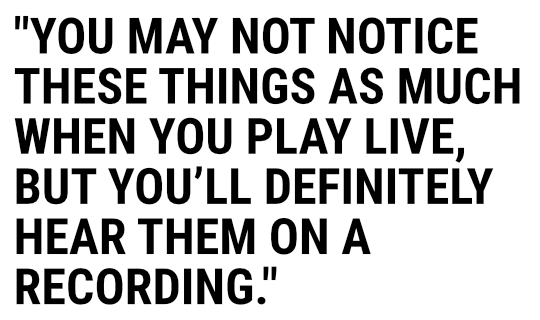 You may not notice these things as much when you play live, but you’ll definitely hear them on a recording. Make sure to give the same detailed attention to every part of the song and play as consistently as possible. In rock and pop music, it’s best to choose a kick/snare pattern for each section and try to stick to it each time that section comes along. Flipping the rhythm around – or varying it too much – can result in an unstable groove. There will always be some spontaneity and on-the-spot creativity when you record, but it’s helpful to work out some grooves ahead of time so you can hit the ground running. Think about how you can use subtle texture changes to differentiate sections of a song. For example, if you have the hi-hat closed on the first verse, you can open it slightly or switch to the ride cymbal for the chorus. Start with the same basic kick/snare pattern for each verse, but as the song goes on, think about small ways to develop your ideas while keeping the same underlying groove going. These small texture changes will shape the music and keep it moving forward. Sometimes you’ll want to be sparse and avoid playing too many notes, while other situations might call for something a little busier (author’s note: simpler is almost always better!). While the engineer can fix mistakes and make edits, there is no substitute for straightforward, solid, and sensitive playing in the studio. One excellent example of this is drummer Philip Selway’s playing on the song “Lucky” from the iconic Radiohead album “OK Computer”. This song has a ton of different sections and many texture and groove changes to navigate. He begins the first verse sparingly with the ride cymbal, and adds the rest of the kit for the first chorus. He continues lightly on the full kit for the re-intro section and second verse, deftly navigating the bar of 2/4. 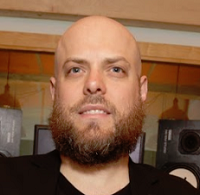 The second chorus is a slightly more energetic version of the first, and he continues adding and subtracting textures throughout the breakdown section and solo. When you’re playing a tune with so many twists and turns, it’s often helpful to write some notes and create a shorthand “Road Map” you can reference while you record. While it’s great to try and memorize everything, it can sometimes be hard to remember all the details when you’re working under pressure in a studio environment. (Note: These Road Maps have been digitized so they’re easier for you to read, but you can check out the original handwritten ones here and here). The ability to quickly write shorthand charts is one of the most important skills a drummer needs to learn new music. Though you may not always need to look at your Road Map while recording, going through the process of writing it down will force you to delve into every detail of the song and become familiar with all its intricacies. Your Road Map should include the song’s form (these are your “driving directions”), as well as any hits, stops, and texture or groove variations. Your first step is to find the pulse of the tune and count how many measures are in each section. Listen for harmonic variations in the chords and lyrics to try and determine where parts begin and end. Most popular music has some combination of sections such as Verse, Chorus, Pre-Chorus, Bridge, Interlude, Intro, and Outro. What you decide to name each one isn’t a big deal, as long as you call similar parts the same name throughout your Road Map (instead of verses or choruses, some people will assign letters to the parts and call them Section A or B). Once you have your form framework in place, you can begin to add other details such as what part of the kit to play on a particular bit, plus any fills or stops and exactly where they occur. It’s also a good idea to sketch out some basic kick/snare rhythms to remind yourself of what to play. 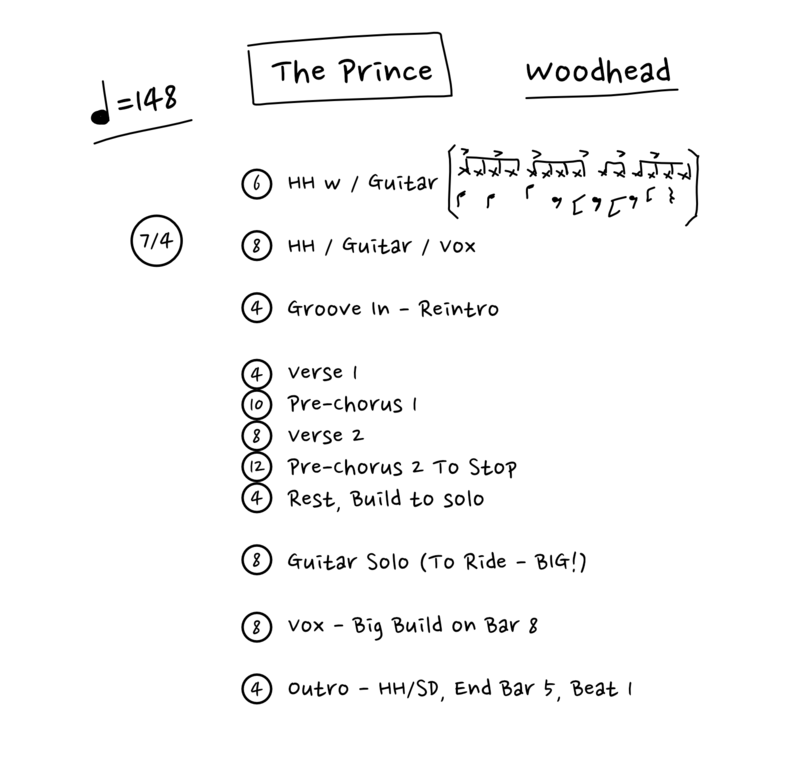 For example, this tune “The Prince” by Woodhead revolves around the same basic 7/4 groove pattern throughout, and uses a variety of texture changes to set the sections apart. In addition to groove and section changes, you can also include lyrical cues in your chart as another point of reference in case you get lost. Be specific, neat, and detailed! Studio time is precious, and you don’t want to have to redo a take because you couldn’t remember your pattern, or because you blew through an important stop or hit. 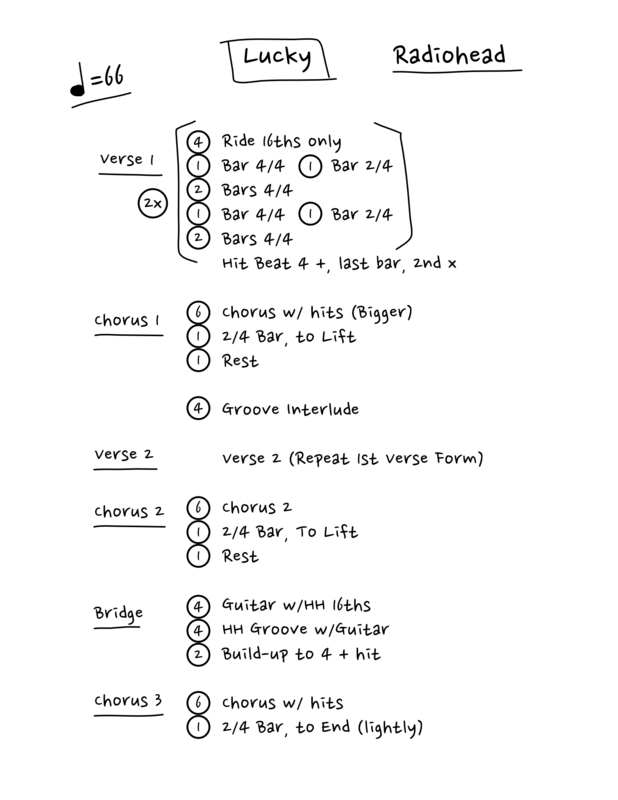 Making a clean and detailed Road Map will help you stay organized and make your recording the best it can possibly be. 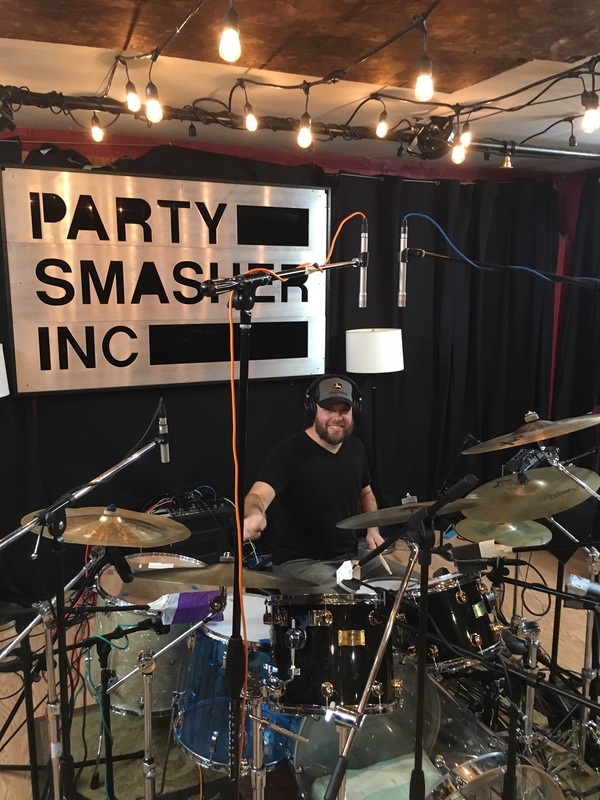 In Part 4 of this Pro Studio Tips Series, we will discuss the strategies for interacting with engineers and other band members in a studio environment, as well as the role of drummer in the post-production process.